The first week of August marks that point in the year where most people I know start to bemoan the impending end of summer. If your circle of friends reside closer to the South Pole, you probably hear fond thoughts of the approach of spring. Be warned though: we have plenty of the current season left! I was so crippled with envy over Corey’s current Neotropical sojourn (with a few family commitments thrown in) that I could barely bring myself to look at birds at all. However, I did spot a curious assemblage of House Sparrows perched in a row along the roofline of one specific house. The attraction of that particular vantage remains unknown. 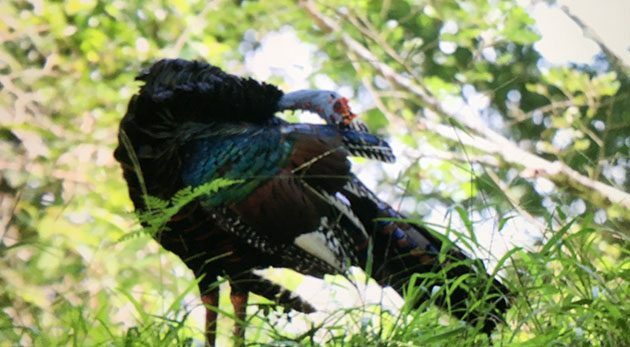 Corey’s Best Bird of the Weekend was the coolest turkey he’s ever seen, the Ocellated Turkey of Central America, seen in a wonderful place: Tikal in Guatemala! What a Saturday morning! The first big wave of migrants showed up on our tidal flats here in la Paz. Not sure how to pick a single bird, but even with the huge numbers of shorebirds, I have to go with a local resident. I got to photograph a beautiful Lesser Nighthawk, sitting on an exposed branch, in the morning. My best ever images of this night time bird! I wish I could also say it was that technicolor turkey but I’m still pleased with adding White-tipped Sicklebill to my year list. Sooty Grouse. It’s always fun to come upon one in the Olympic Mountains.